Old Forge Wedding on Fourth lake..A mid summer wedding. The Adirondack mountains. The harsher seasons have yielded to the gentle summer weather that drew so many 1800’s travelers deep into the Adirondack mountains. 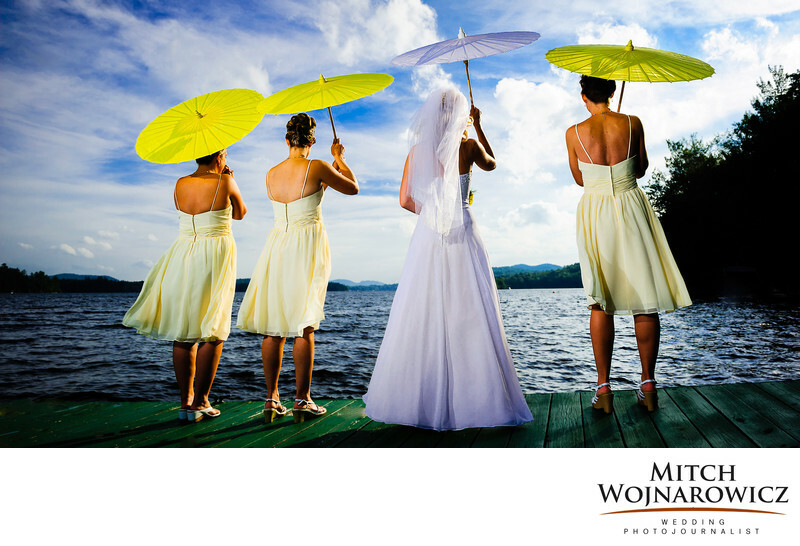 And on the edge of Fourth Lake at the Northwoods Inn, a bride and her bridesmaids pause by the side of the lake as the sun begins to drop on one of the longest days of the year. ..I was attracted to the blue summer sky and the sweeping clouds. The colors of the parasols and bridesmaids dresses. And to the magic Adirondack light, reflected from behind us off of another structure which brightened their backs. Even as an accomplished expert in lighting, I always look for great natural light wedding photography. But, at a fast moving event like a wedding, you need to watch for inexperienced beginners who claim they are natural light photographers. It simply means they can’t handle lighting. And their ability to seek out great light isn’t there as they can’t SEE. It takes vision and the ability to see, in your mind, in order to light a scene with supplemental lighting. And that ability to see the light means an experienced photographer such as me can see it in my mind, then create it, or can see deeper and more completely the right that nature provides. Keywords: adirondack (60), Old Forge (6).